The Olive Grove Wedding Venue is on the lake side of the Wanaka-Mount Aspiring Rd. 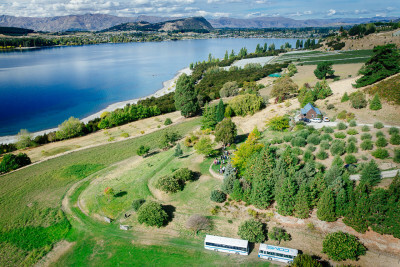 The entrance to Barn Pinch Farm and The Olive Grove is 4km from the centre of Lake Wanaka township. Head out of town on Mount Aspiring Rd and turn right 300m beyond Rippon Vineyard. The driveway has a curved stone entrance and wooden sign bearing the name Barn Pinch Farm. We welcome viewing of our venue by appointment. We are always getting lovely feed back from our newly weds. We have an online calendar to show dates that are available as well as and enquiry form and contact details..